Recent posts show us the narrow way of the cross in Matthew, Mark, and Luke to New Jerusalem. The Lord tells us that we must deny ourself, take up our cross, and hate and lose our soul life. To lose our soul life is to allow the eternal life to spread, to grow in us. Apart from this we are not qualified for New Jerusalem. Jesus denied His soul life throughout His ministry and laid it down in death, so that He could release the divine life abundantly to us. The laying down of soul life for releasing divine life applies to us also. “In this we know love, that He laid down His [soul] life on our behalf, and we ought to lay down our [soul] lives on behalf of the brothers” (1 John 3:16). The denying and losing is our responsibility, yet we cannot do it by ourselves. Self cannot deny self. We apply the death of Christ available in the eternal Spirit. 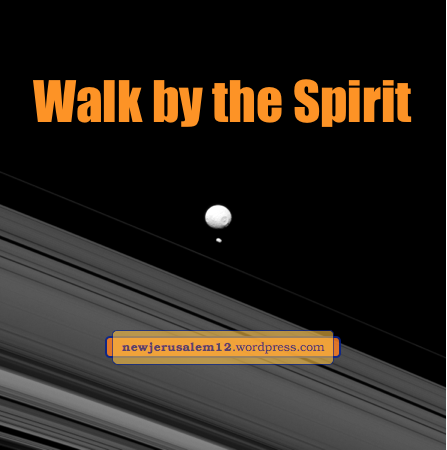 Romans 8:13 tells us “by the Spirit you put to death…” Galatians 5 says, “Walk by the Spirit.” This is the Spirit of reality promised in John 14, which brings to us the reality of the death of Christ. Our way to New Jerusalem is narrow, constrained by the cross, and the reality is in Spirit. Photo of Saturn’s rings and two moons courtesy of NASA. In New Jerusalem we will see the face of God and the Lamb (Rev. 22:4). At that time we will see Him clearly, face to face without any veil or obscuration. We should not wait until New Jerusalem to behold His face. We cannot see our Lord physically today, but prior posts have verses about beholding in our current Christian life. • By believing, we behold the Lord in resurrection (John 12:44-45; 14:19). • He said that after His resurrection “you will see Me” and rejoice (John 16:16-22). • Then He prayed that we may be with Him to “behold My glory” (John 17:24). __the glory of God in the face of Jesus Christ” (2 Cor. 4:6). • By turning our heart to the Lord, we behold and reflect His glory (2 Cor. 3:16-18). • Also, putting away encumbrances and sins, we “look away unto Jesus” (Heb. 12:1-2). All these verses are for us today, not waiting until New Jerusalem. These are not unusual events like Peter, James, and John on the mountaintop (Matt. 17) nor Stephen while being stoned (Acts 7) nor Paul on the way to Damascus (Acts 9). What is in the verses above should be a “we all” (2 Cor. 3:18) experience of beholding His face. This experience requires denying our self, turning our heart, and putting away every hindrance. We are running a race with endurance. Our reward will be at the Lord’s return. “We know that if He is manifested, we will be like Him because we will see Him even as He is” (1 John 3:2). 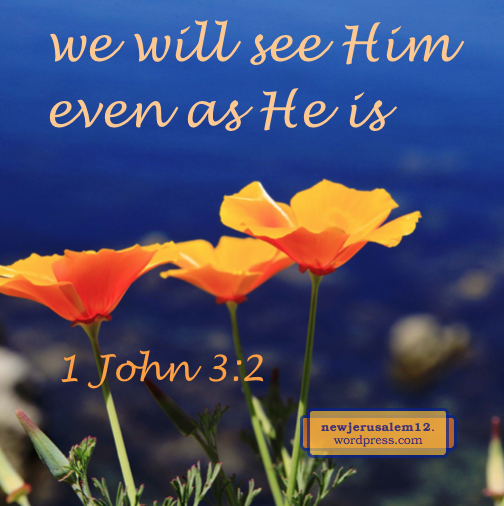 This unobscured seeing will continue eternally in New Jerusalem.